Leave the M1 at Junction 29 (signposted Chesterfield) and at the roundabout at the top of the slip road take the 2nd exit onto the A617 (signposted Chesterfield). Head through Chesterfield town centre and follow the signs for Baslow, Bakewell and Buxton. To get to Buxton follow the A619 to Baslow and then follow the A623 through Calver and Stoney Middleton – this will bring you out in Dove Holes which is on the Stockport side of Buxton. Once in Dove Holes follow the A6 which will take you all the way into Stockport via Whaley Bridge, Disley, Hazel Grove and Davenport. 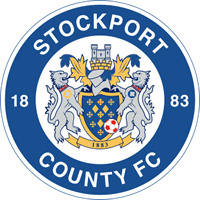 Stay on the A6 until you pass Stockport College which will appear on your left hand side. At the traffic lights immediately after Stockport College turn left onto Greek Street. At the roundabout at the end of Greek Street take the 2nd exit onto the B5465 (Mercian Way). You should be able to see the floodlights in the distance. Carry on along Mercian Way and the ground is on the left hand side. To get to the doorstep of the ground take a left into Caroline Street and then turn right onto Hardcastle Road. ground is on the left hand side. Leave the M62 at Junction 12 and join the M60 (signposted Manchester Airport, Ring Road S & E). Leave the M60 at Junction 1 (signposted Stockport Town centre) and at the roundabout at the top of the slip road take the 2nd exit onto the A5145 (Signposted Stockport town centre / Stockport West). At the next roundabout take the 3rd exit onto the A560 (signposted Buxton). Head through two sets of traffic lights (passing the Stagecoach bus depot and the fire station) which will bring you into Edgeley. At the roundabout by the Armoury / Grapes Pub take the 3rd exit onto the B5465 (Mercian Way). You should be able to see the floodlights in the distance. Carry on along Mercian Way and the ground is on the left hand side.